“Artistry” – A group Show of Designers & their creativity who are part of The Guild of Designers & Artists family. A key focus was on craft showcased through a different medium like Paint, Ceramic, Wood, Metal & alloys. 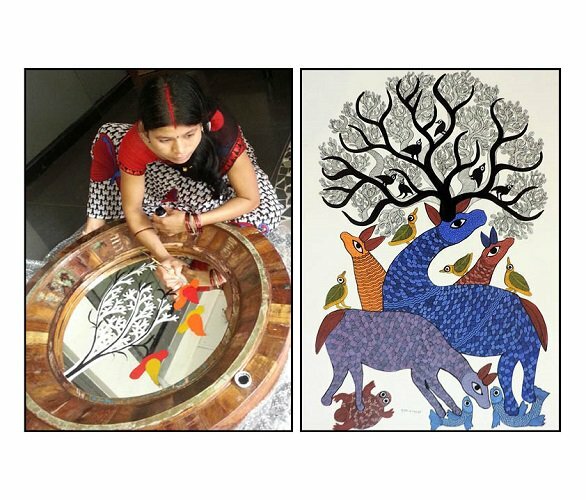 An overwhelming response, where my experiments with Gond – A Dying Tribal Art from Madhya Pradesh contemproraised for the Modern Consumer was hugely appreciated. Sonia Dhingra work in Ceramic was par excellence. Amit Sharma and his experiment with white metal ,aluminium & bronze converted into some amazingly beautiful artifacts & furniture pieces with a “Boat” theme. Ashish Gupta with his symmetrical patterns, intricate detailing and varied finishes which are his forte had some amazing pieces on display. Valay Gada – had some exceptional art pieces which were made primarily in metal & their alloys, handcrafted by traditional craftspeople. It was very encouraging to get such an amazing response to the exhibition. Thanks for all your encouragement. We look forward to your support in the coming year.